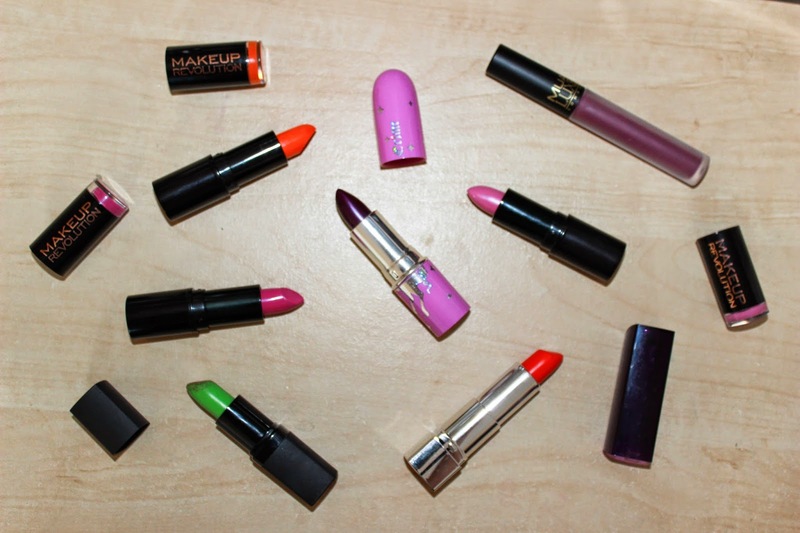 From left to right: Scandalous Lipstick in Vice by Makeup Revolution, Poisonberry by Limecrime, TMPL by Barry M (changes to pink), Scandalous Lipstick in Crime by Makeup Revolution, Moisture Renew Lipstick in In Love With Ginger by Rimmel, Amazing Lipstick in Enchant by Makeup Revolution, Luxe Velvet Lip Lacquer in Kooky by MUA. As summer's just around the corner (and X is a really hard letter to write for!) 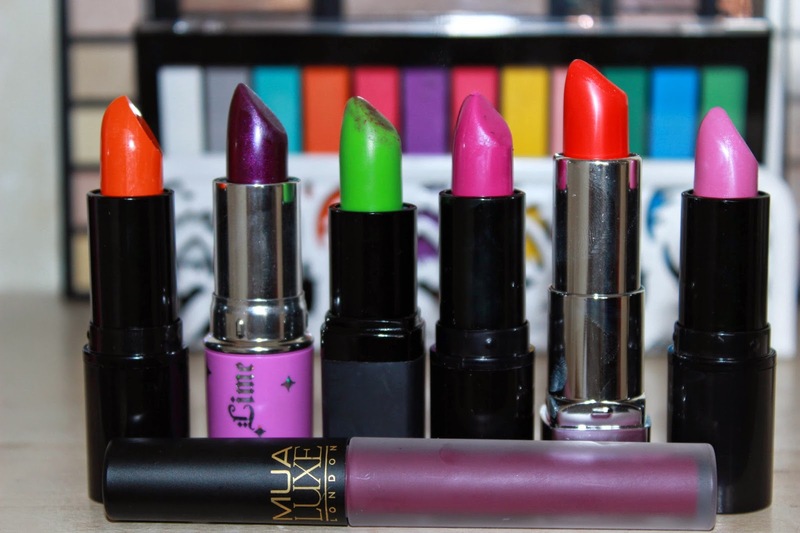 I thought I'd share with you some of the brighter, bolder shades in my collection that give you an exaggerated bright, bold lip. As you can see by the photo, a lot of this collection is courtesy of the new kids on the block: Makeup Revolution and for a pound a piece you really have no excuse to get experimenting this summer which is exactly what I've done and I just can't wait to buy more! For some reason I'm quite font of my purples and lilacs at the moment - I'm not quite sure how this obsession came about but I love it! The purple hues really bring out the green in my eyes and the red in my hair (don't ask me how - they must be magic!). I've always been more of a dark lip kinda gal so I think this is just me clinging onto the A/W shades in a wearable way for summer. I've gone for quite the variation of finishes too - some are shimmery (Poisonberry by Lime Crime) whilst others are matte (Luxe Velvet Lip Lacquer in Kooky by MUA) but I can certainly say that all are very buildable so whether I'm looking for a light hint of colour or a full and stricking lip - these guys certainly have me covered. The next item on my summer lip list is Topshop's Lipstick in Infrared that I think I'll be treating myself to at the weekend.I think the organgey-red colour is just too darn beautiful not to purchase! What's your lippy this summer?